Occasionally, we get behind, and the CSA vegetables take over the refrigerator. My heart sank the other day when I realized that there was an entire garden’s worth of greenery to be eaten before more was due to arrive. But I plunged into the recipe box, the plastic box that has taken up permanent residence in the dining room, the plastic box full of the recipes that I am forever ripping out of the newspaper, or printing out from Smitten Kitchen, or scavenging elsewhere on the intertubes, the plastic box which one day I will sort. I’m fond of curry, but I tend not to cook with it all that often because although my husband will eat and like curries that are presented to him fully formed, if asked in advance he’ll reject them conceptually – something about curry having been invented to mask the flavor of spoiled meats in hot climates. But the recipe box turned up a recipe for a saag (curried greens) from a blog that I can’t remember ever having visited – and it sounded good. Being a kind of seat of the pants cook, I started it before realizing that I was missing two sort of key ingredients, but I punted and it was just fine – delicious even. We ate it over basmati rice, with corn on the cob alongside. The next morning over breakfast, I played executive chef and invented a pasta dish in my head, for my husband to make for dinner. He took it and ran with it, adding the fall crop peas from the farm market that I’d completely forgotten about. And the third day, we ate enough green salad for an army, thereby making room in the fridge for more greens. Anyway, without further ado, here are two recipes for making a huge dent in the CSA greenery – I think you can figure out a green salad on your own. Heat the butter over medium heat in a large pan with a lid. Add the curry powder (and the ground ginger, if your pantry is as bare as mine was, and the cayenne if you’re going that route). Cook gently for a minute or two. Add the chopped onion [if you had one], and cook 4 or 5 minutes, until soft. Add the minced ginger, garlic and chili pepper, and cook until fragrant, another minute or so. Stir in the tomatoes, greens, and water. Add salt to taste. Bring mixture to a boil, then turn the heat down to simmer, cover the pot and braise for 20-30 minutes. Carefully, because it’s hot, transfer to a food processor and pulse it until it’s mostly chopped (not completely pureed). Return to the pot, add the heavy cream, and simmer for a few more minutes. Serve over rice, or use as a sauce for chicken or tofu. Note: You could make this with just about any greens, except maybe lettuce. I think it'll work with the packets of blanched collards and random asian greens that are cluttering up my freezer. Put a pot of water on to boil – for the pasta. Cook the peas in the butter, for a few minutes, until done. Transfer to a serving bowl, and add the lemon juice and zest, and the olive oil. Set aside. Cook the pasta until done. Drain and add to the bowl with the peas. Dump all of the arugula onto the pasta, and toss – the heat of the pasta will wilt the arugula. Add the grated parmesan, and salt and pepper to taste. Serve with shaved parmesan on top. Note: It sounds like a spring pasta, doesn't it? But my farm share has been giving us scads of arugula, and we ended up with fresh peas from the market. I asked the farmer about them; she said that she'd grown peas in the spring, then planted beans in the same area, and then found that she had volunteer peas coming up among the beans - a bonus crop! So long ago that I don't remember where it came from, I copied a set of questions to ask the kidlet - a meme, if you will. Here's what she - at six and 5/6 - has to say about me. And despite a huge urge to editorialize, I have refrained. When I wake her up and kiss her. When you don't do what she says. 4. What does your mom do to make you laugh? Putting me to bed - she always forgets to sing me a lullaby. She works at a ballet studio. Never forgets to read me a book. Hug and kiss and have fun. We both have blonde hair. My personality is prettiness and mom's is "I don't know". Remember the silly M&Ms policy where they wouldn't print #! @?&* on the party favors for my father-in-law's 80th birthday because it was a bad word and they were a family company even though #! @?&* isn't a word at all? So, I tested them out. To her great joy (chocolate!) and my vague feeling of thwartedness (rejection would have been fun to snark at), Niobe got a bag of M&Ms from me for her birthday (today! ), complete with bleep. Now, of course, I'm wondering whether the appearance last week of that new TV show - $#*! My Dad Says - meant that the M&Ms people had relaxed their stance on the "bad word" status of#!@?&*. One of the things I love about taking books out of the library is finding the oddments that other people have used as bookmarks: a cash envelope from a defunct bank, a ticket to some outdoor Shakespeare two years ago, a grocery list. The other day, the girl came home from her grandparents with a "souvenir" card from her father's birth stuck into the book she was reading. 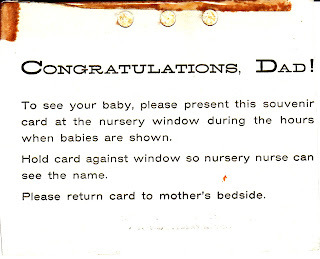 Back in the day, babies stayed in the nursery and Dad could only peer through the glass "during the hours when babies are shown". 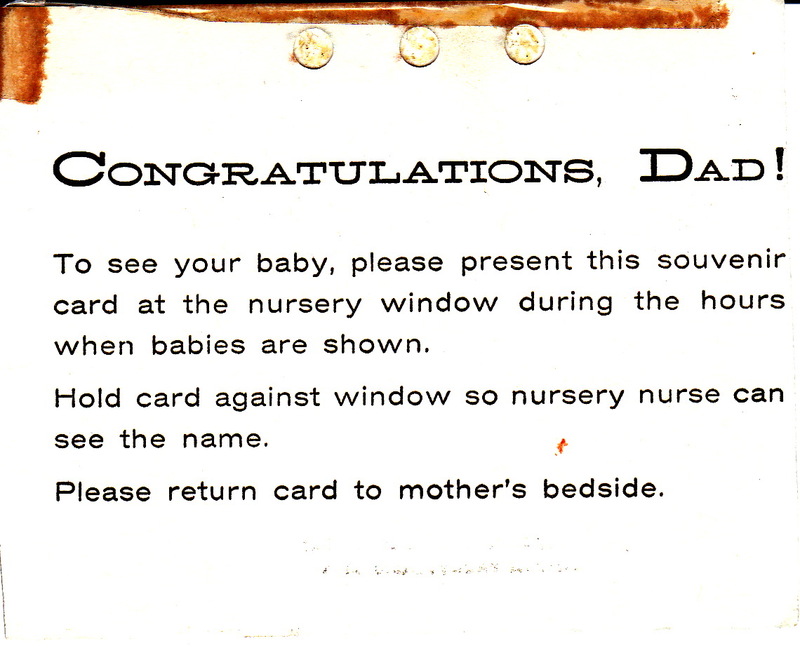 Incidentally, lest one think that formula marketing in hospitals is new, this 50 year old card was "compliments of Pet Milk Company". I'm prone to using index cards as bookmarks. For years and years, my mother worked at a non-profit that provided a free audio anthology of magazine writing to blind people. They had an idiosyncratic method of managing the mailing list - or rather, managing the complicated process of ensuring that people were eligible to get onto the mailing list - a method that involved thousands and thousands of index cards on a temporary basis. The net result of all this was that my mother brought home scads and scads of barely used index cards - typed on one side, generally blank on the other, and therefore perfectly serviceable for note taking, bookmarking, list making. She brought home so many of them that there are dozens of shoeboxes of index cards stashed hither and yon in her house, and some in mine too. Sometimes I get a little wistful - there are often little pencil edits on the cards in my mother's handwriting - but then I turn 'em over and write "saver dog", which I found on a card in a book just the other day, a reminder that Miranda had once referred to a St. Bernard as a "saver dog". This day, the 23rd of September, it's odd. Not because 23 is an odd number (though it is, and prime too), but because it's the 17th anniversary of the day my friend Peter's boyfriend died. (Huh, 17's another odd prime.) The reason I remember when he died is because it's smack dab equidistant from two birthdays: my mother's, on the 21st, and my husband's, on the 25th. For years, in my head, it ran birth-death-birth. Now it's not so pat, since my mother's birthday is complicated by the fact that she's dead. Birthday of dead person, death day of dead person, birthday of living person. It's curious how memory works. I can't remember when anyone else died, except my mother, and again, her death is paired with another's birth: my nephew was born on the 31st of March, she died on April Fool's Day. And where did that 17 years go? Thinking of you, Petey. It's quite tall, so I think it's a giraffe. But maybe it's a goat? Or a llama? In any case, I've been watching it take shape on the other side of the train tracks from where I customarily wait in the morning. Putting the kidlet to sleep has been a major chore recently. Out of necessity, she was sleeping with us during our two week road trip - and even in the places that had a cot for her, she tended to climb in (or worse, kick me out to the cot). Furthermore, because we were all in the same room, we all kind of had to go to bed at more or less the same time. So when we came home, it was "Mommy, are you going to go to sleep at the same time as me?" over and over again. We'd do the bedtime routine, I'd read her a chapter of something or another, and put her in her bed. BUT. Either I'd be downstairs doing stuff and my cell phone would ring, with her calling me from the house phone, or I'd come upstairs and find her making forts and playing with dolls. In short, she just won't go to sleep without being right next to me. I got so frustrated the other day that I pulled out all the sleep books that I keep under my bedside table as talismans, and flipped through Weissbluth and Ferber and Kurcinka. Tucked inside one of them, I found an essay I'd ripped out of Brain Child in 2007 - an essay by Jennifer Niesslein talking about her seven year old who yeah, prefers to sleep with mom. And I felt awesomely better about the whole thing. One day, she'll outgrow it. Until then, I can just enjoy how much she loves me. So, you know I'm a Nintendo Enthusiast, right? Sometimes they send me stuff - DS games, Wii games. They never tell us they're sending it, it just shows up, a magic box on the doorstep. And the games are rarely unaccompanied - there's always a little relevant something alongside, like the huge plush dolphin that came with the Endless Ocean game, or the teensy perfect top hat that accompanied the new Professor Layton and the Unwound Future. I'm so not a gusher, but the Brand About Town team is awesome. Their promo tie-ins are always creative, they're incredibly charming to work with, and they are very hands off - letting word of mouth work instead of trying to dictate the message. Yesterday, I came home from work and found a new backpack filled with a pad, water bottle, Mario keychain, umbrella, pen - and a little note: welcome back to school from your friends at Nintendo. No game, but no matter - the girlie was beside herself with joy. "Oh mama, can I use my new backpack tomorrow?" Later on, we went off to open house at her school and met the second grade teacher with the nine syllable name. Up on one of the walls in the room was a series of mugshots - each child's picture along with an "All About Me" essay. My name is Miranda. My mom writes Nintendo blogs and I get lots of Nintendo stuff. I love cats. And I like the Mets. At school, I like recess and snack. I like Art! I am unique. I have 3 scars. Yup. 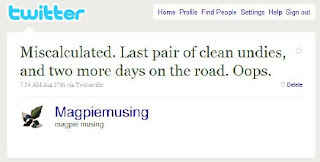 Viral marketing. Give a DS game to the mom, and the kid tells everyone how wonderful Nintendo is. And she wrote that essay BEFORE the backpack showed up in the mail. The only problem is, what do I do if the principal asks me about my blog? How is it possible that we live in a 1500 square foot house, and own six vacuum cleaners? A small “electric broom” because I hate getting out the big guns, though I hate the way my hair wraps around and around the whirling brush thing. An old canister type one that works but not very well and lives in the basement and maybe ought to go to the thrift shop. A new canister type one that works splendidly but is too complicated for ordinary humans. And a brand spanking new vacuum that showed up on my doorstep the other day, bewildering my husband, because I went to a party that the Mouthy Housewives threw during BlogHer. These vacuums, they mock me. Because the thing is that I never vacuum. Something's wrong here. "The next day was foggy. Everything on the farm was dripping wet. The grass looked like a magic carpet. The asparagus patch looked like a silver forest. On foggy mornings, Charlotte's web was truly a thing of beauty. This morning each thin strand was decorated with dozens of tiny beads of water. The web glistened in the light and made a pattern of loveliness and mystery, like a delicate veil." A couple of months ago, I made an offhand comment on an article in my local newspaper (which only exists on-line, so why do I persist in calling it a paper?). My comment prompted a personal response from the editor like 30 seconds later, and the next thing I knew, both my husband and I were signed on as volunteers to help get a new farm market off the ground. It started Saturday and it turned out to be glorious. The day was perfect, the vendors were great, someone was there with a pizza oven on a trailer making piping hot fresh pizzas, and I spent two and a half hours chatting with friends and neighbors and acquaintances and farmers and strange dogs. And I felt relieved and proud that people showed up, because publicity - which is what I've been doing - is not my strong suit. Anyway, I came home with a weird mish-mosh of things, like a wild boar cacciatorini and some fresh eggs and a jar of "cream of sausage" tomatoes (which was neither cream nor sausage, but just pale yellow plum tomatoes) - and a quart box of tomatillos. Why I bought the tomatillos is kind of a mystery to me, but it could be because they came from a tiny farm run by two charming women with dirt under their fingernails. Of course, then I had to figure out what to do with the tomatillos - something I've never ever before bought. Toss together and eat. I had the leftovers for lunch today, and if anything, it was even better. We roasted the tomatillos until they collapsed. After they'd cooled, I buzzed them with the hand blender and stirred the rest of the ingredients in. I should have chopped the tomato up a little finer, but no matter - it was a lovely, sweet sauce. Moral of the story? Try the tomatillos. Last Christmas, my husband & I bought a dollhouse for our daughter. We quickly realized that we needed a table of some sort to put the dollhouse on, and after canvassing various local stores and on-line retailers, we ended up in the Gothic Cabinet Craft store in (redacted). We wandered around the store for awhile, not finding anything that was the needed dimensions. Finally, a salesperson pointed out a piece that was sitting up high, on top of a modular wall system – not down at floor level. In fact, we never would have noticed it without the salesperson’s assistance. As it was the right dimension, we decided to order it. The salesperson wrote up the order, we signed it and paid for it, and left the store. A couple of weeks later, my husband returned to pick up the piece – and found that it was not what we had ordered. Yes, the piece matched the stock number on the order form – but the salesperson wrote down the wrong item number on that order form. There was no way for us to have known that the clerk made a mistake until we saw the wrong piece of furniture. Stock numbers are idiosyncratic and obscure, kind of like medical billing CPT codes. Would you recognize that your doctor wrote down the code for an angioplasty when in fact you had a cholecystectomy? Unlikely. We protested to American Express and after much back and forth, American Express has sided with your store. I am appalled by this. We are out nearly $400 because of an error made by YOUR SALESPERSON. I simply do not understand why our failure to recognize the salesperson’s error in the stock number should be held against us. The salesperson’s argument that we changed our minds is just not true. We needed this, we wanted this, we thought we ordered it. We would have glad taken receipt of the item had it been the right item. I’m not a complainer – but this situation makes my blood boil. This is heinous treatment by your company and by American Express, and if I don’t get resolution I am taking this matter to the New York Times, the Better Business Bureau, and small claims court. I hope you can help me. I have been a CardMember since 1987. Membership has its privileges, right? We protested to American Express and after much back and forth, American Express has sided with Gothic Cabinet Craft. I am appalled by this. We are out nearly $400 because of an error made by a salesperson. I simply do not understand why our failure to recognize the salesperson’s error in the stock number should be held against us. I’m not a complainer – but this situation makes my blood boil. This is heinous treatment by your company and by Gothic Cabinet Craft, and if I don’t get resolution I am taking this matter to the New York Times, the Better Business Bureau, and small claims court. I'm on the verge of cancelling my Amex card, and I am never shopping at Gothic Cabinet Craft again. What happened to "the customer is always right?" And on second thought, maybe the title should have been "I Feel Better Now Though I'll Feel A Lot Better When I Get My Money Back". Because right this minute, I'm still out that money. I have become my mother. Or my grandmother. Or actually? The self-sacrificing ur-mother. Yesterday's CSA pickup included five ears of corn, which we decided to have for dinner. My people were outside peeling it; when I went out to check on them, my husband announced that he'd thrown one away because of a surfeit of worms and worm slime. "Yeah, Mommy, it was gross!" concurred the six year old. I offered to take a look at it. Squeamishly, my husband extracted it from the compost bucket. It had a little worminess at the tip and 2 or 3 spots elsewhere, nothing a paring knife and some running water wouldn't fix. So I fixed it. And later, despite protestations - "don’t eat that, Mommy" – I ate it, divots and all. And it was just fine. How about you? Do you eat the grisly ends and chicken necks, and give everyone else the choice bits? Or do you save the best for yourself? The sky in PEI is big and beautiful. 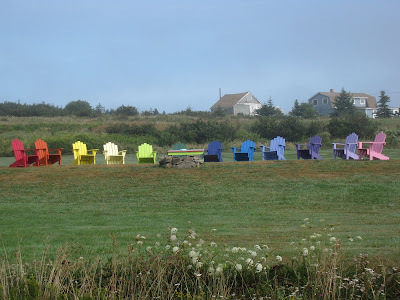 We were on our way to dinner, on PEI at dusk, somewhere between Panmure Island and Murray Harbour, and this little rainbow appeared between the trees. Later, after dark, the bright moon lit up a plane's contrail - something I think I've never before seen at night. Is Your Bunny Under Your Lion? 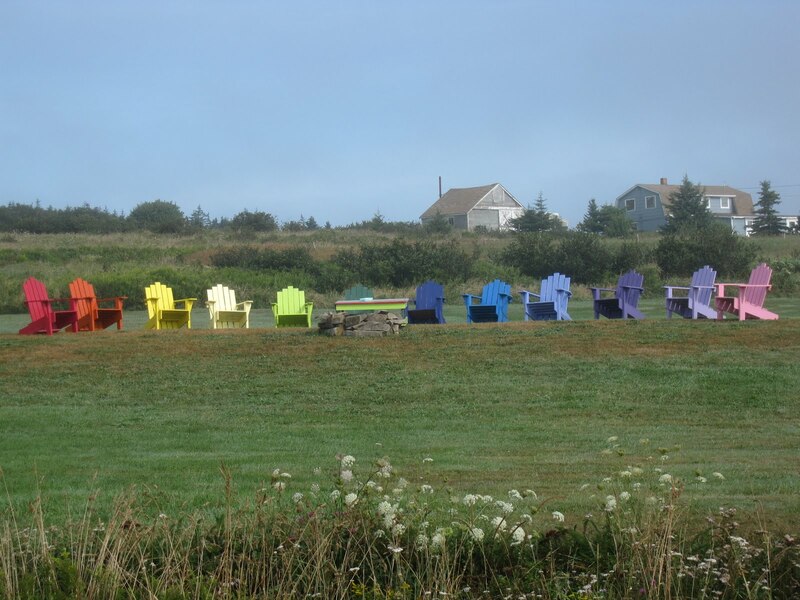 Would you not like to be in one of these inviting chairs, gin and tonic to hand, toasting the end of summer? Seeing as I whined on Twitter about the fact that I’d miscalculated how many pairs of underpants I would need for that two week vacation of ours, someone was bound to leave a comment on my “vacation by the numbers” post. In point of fact, I lost track. We practice a suitcase management technique called “vacation underwear” where you pack and wear all your really ratty undies – the kind that can always be worn once more, but probably shouldn’t be – and throw them out along the way. After those were gone, I moved onto my standard issue cotton bikinis, which were duly filed away into the laundry bag at day’s end. Then I realized the impending shortfall, and suffered through a couple of days of two in a row – because I just couldn’t bring myself to doing laundry at a Laundromat for three pairs of underpants, and handwashing was out of the question because they’d have never been dry. Finally, though, we got to Mecca and hit the Jockey store in Freeport – all hail discount shopping on vacation (and yes, we went to the LLBean Mothership too). And then I found One Last Pair, which actually turned out to be the final pair of vacation underwear, and thus was discarded at home when we finally got there. All I know is that I have six new pairs, three that I like and three that I don't. But let me ask you this: if you go away on a two week road trip, do you take two weeks worth of underpants? 2 lunches with bloggers (Bon and Sue), which also means two more bloggers met in person! The only time we stopped for fast food in sixteen days on the road was for donuts and coffee at a Tim Horton’s one morning, just because we were in Canada and all.